desalination of geothermal water for irrigation, which would help to increase irrigation water efficiency (increase the productivity of one meter cube of water) and economic valorisation. 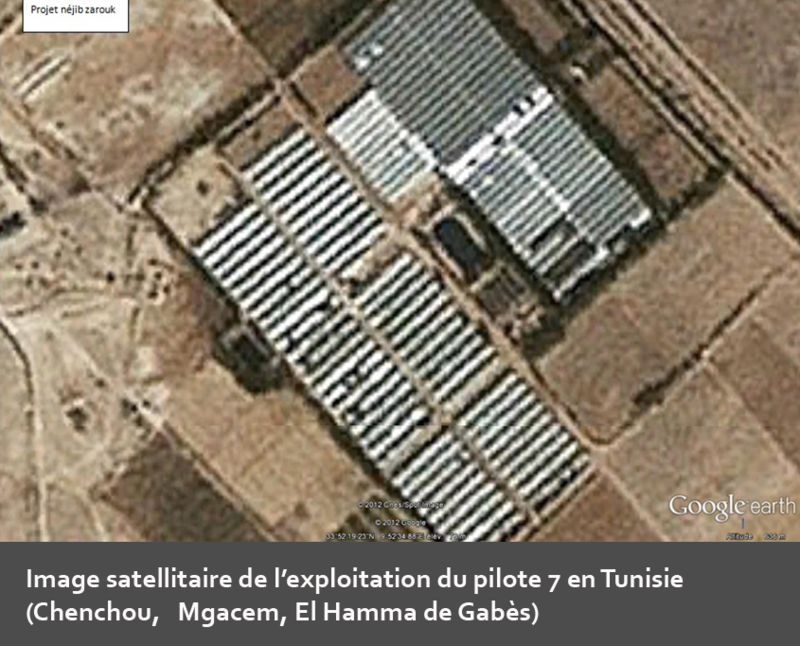 In addition to its demonstrative function, this pilot was conceived to disseminate and share the results of a highly efficient agricultural system at the social, economic, and environmental level, with the three SASS countries and to transfer the technology used in this agricultural system to the central zone of Oueds (Libya) which was previously designated for pilot 4. The pilot plot was initially a small private farm belonging to Mr Nejib Zarrouk, and then it developed to become first a small firm owned by multiple shareholders and then a company named Zina Fresh. The company owns a private well located on the farm. The static level of the water table is 34m. Pumping is carried out using a metering pump (pompe immegée) in an underground depth of 46m with an average flow rate of 50l/s. Water on the Continental Intercalary is of a sulphate nature and has a total salinity of 4g/l. The well water temperature deceased compared to previous years (from 53 °C to 40° C). Hence, Zina Fresh Company had to bring additional heat to its greenhouses using an olive-pomace boiler (Chaudière à grignon d’olive). Brackish water was initially used for irrigation and crops were conducted in natural soil. Due to the multiple negative impacts of salinity on the soil and crops and the damage caused by fungal and nematode diseases on crops, there was a recourse to the d3esalination of well water and use of artificial substrate to replace natural soil (except for under-tunnels crops). Zina Fresh Company possesses two desalination units by reverse osmosis which produce 35m3 of water per hour having a salinity of 0.2g/l. A localized fertilization by fertigation is practiced on this farm. The phytosanitary treatment combines both conventional biological and chemical-based control. The choice of plant species and varieties is dictated by the market which is mainly European and the company is equipped with a packaging chain according to European standards.